The basis for these original fruits is simple polystyrene balls. Most of the fruits are made from balls (such as apples, oranges or strawberries) while the pear is made from a polystyrene egg shape. A knife is used to make slits in the fruits for the leaves or stalk. 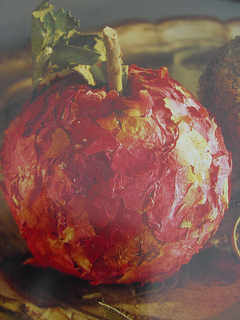 For a green apple, you apply glue with a paintbrush to the ball and roll it in dried herbs. A red apple is made in the same way but with rose petals. Keep applying glue depending on the coat which is being applied. Glue is then applied in the slits and you place herbs or leaves inside. If you spray the ball with flower paint, it has a protective coating. An orange is made by applying pieces of orange coloured tissue paper: you place a few pieces on the ball and paint them so that the paint soaks through the paper in parts and sticks to the ball. Use a needle to make little holes in the ball before the paint has completely dried. Use a knife to make slits where the leaves and stalk can be placed in the polystyrene balls. Cut the ball so that it has a shape resembling an apple. Now use a paintbrush to apply textile glue to a part of the polystyrene ball. Hold the ball where the slits are and make sure that the glue does not dry up; however the surface of the polystyrene ball should not be wet. The ball can now be rolled around in herbs on a plate; the herbs can be pressed a little into the glue. Apply glue to the slits as well. Now you can take a little stick as the stalk and glue it into the hollow. Stick down a dried leaf next to it. Hold onto the leaf while the glue is drying for the best results. To finish, the deco apple is sprayed with flower paint. First of all the tissue paper must be ripped into little pieces. These pieces of paper are laid overlapping on the polystyrene balls then paint is applied with a paintbrush. The whole should be covered and the paint should be allowed to dry a little. Use a needle to make little holes in the surface of the half-dried paint, so that it resembles the skin of an orange. For the little orange stub: stick a spice clove in the top.